There is way too much talk around luck and fantasy football. And sure, it’s for good reason. There’s luck involved. But there’s also luck involved in landing a job, or whether or not a jump shot goes in. Does that mean you should stop all preparation because chance is part of a desired output? You would never be put in the position to be lucky if you had never prepared. If you didn’t receive a college degree in the first place, then there’s little chance that you would compete with university graduates for a corporate job. If Kevin Durant decided to take basketball only moderately seriously, he would have never been put in the position to drain the final shot against Dallas in the 2012 playoffs. Luck is typically an excuse for lazy people. Whether you want to believe it or not, you can prepare for success when it comes to fantasy football. It’s because, at the end of the day, math and logic are important aspects to the game. You’re not playing the lottery when you draft LeSean McCoy. He’s clearly better than Danny Woodhead. 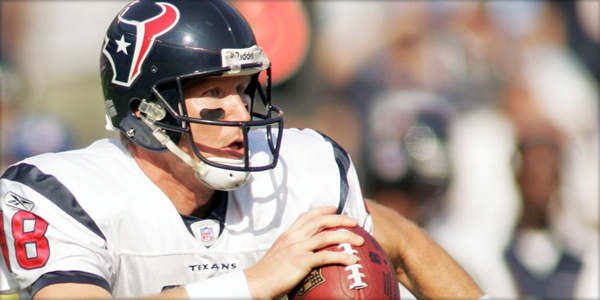 If luck was the driving force in fantasy football, then why not just get Sage Rosenfels in the first round? 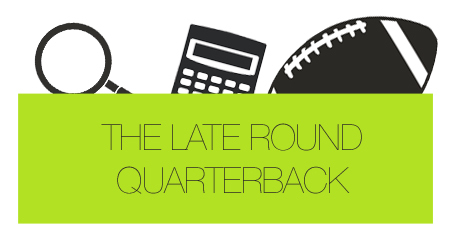 I wrote The Late Round Quarterback because I always see fantasy football players approach their lineup changes and draft choices haphazardly. And to be honest, a lot of these owners actually know a thing or two about football. Unfortunately, that’s partially the issue. You see, we’re all aware of the shift that’s been happening in the NFL over the past few years. Quarterbacks are throwing fifty times per game, and they’re putting up numbers that we’re used to seeing in Tecmo Bowl. Seriously, it’s crazy when you think about it. Drew Brees just finished a season averaging close to 350 yards per game throwing the ball. Matthew Stafford played his first full campaign as the starter for Detroit and surpassed the 5,000 yard mark. I mean, come on. There were ten players in the NFL this past year that passed for 4,000 or more yards. In 2003, that number was just two. The NFL is evolving. But just because the NFL is morphing, doesn’t mean fantasy football is changing too. Quarterbacks may be throwing more touchdowns and passing for more yards than ever before, but they’re still not the most important position in fantasy football. The fact is, quarterbacks have never been the MVP of fantasy football. It seems rather counter intuitive considering the quarterback position is the most important on the football field. You just can’t win the Super Bowl anymore without an elite-level quarterback. You can, however, win your fantasy championship without the typical top-notch guy. And it’s simply because of the way most league scoring systems and lineups are set up. When a typical league is starting one quarterback per team and at least two running backs and receivers per team, you can see, from a broad level, why this is the case. It’s all about value. That’s what The Late Round Quarterback is about. When you go to draft your fantasy team in late August, you’re not looking for players to simply fill your team. You want the most bang for your buck. You want the highest combination of points throughout your entire lineup. That dude with Tony Romo? He’s not going to be getting that. Instead, Third and Fourth Round Quarterback Guy is stuck with inescapable voids throughout his post-draft squad. When he decided to get Tony Romo in the fourth round, he failed to realize that he was losing a heck of a lot more points by not snagging a wide receiver or running back. In other words, he could have just waited an additional four rounds before getting his quarterback, because the point differential between Tony Romo and that eighth round quarterback is pretty minimal. If you don’t believe me, then buy my book and I’ll prove you wrong. If you do believe me, then buy my book and I’ll give you many more tips to help you win your fantasy league this year. There’s a lot more to fantasy football than just this factoid. Fantasy football, over its history, has been looked at as a game of luck. And sure, luck is going to play some sort of role. But players and owners consistently fail to realize that there’s a true formula to success. It’s worked for me, it’s worked for friends I’ve introduced the concept to, and it can work for you. It’s as simple as following a little bit of logic.